Panel Built Inc.’s new one-hour fire rated wall has been awarded national certification in accordance with the ASTM E 119-98 Standard Fire Tests for Building Construction and Materials. The company’s 3-inch thick modular walls exceeded the stringent testing guidelines required by the ASTM standard. “It should be noted that the three-inch thick wall panel system was tested with nothing covering the five-eighths-inch Type X gypsum on either side, but the addition of any wall coverings would only enhance the wall’s fire endurance rating,” reported the certified third party independent testing agency. 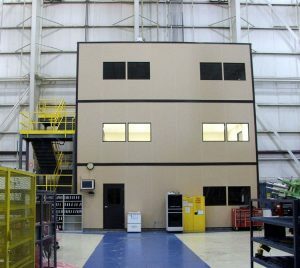 The company’s ASTM-certified modular walls meet the high standards required by military, government and municipal building codes, and provide fast construction and application flexibility options for the user. Since 1995, Panel Built Inc. has manufactured interior buildings and enclosures, exterior buildings, pre-assembled buildings and powder-coated mezzanines for industrial, military and commercial uses. Headquartered in Blairsville, Ga., Panel Built and Mezzanine-Built lines are represented across the U.S. by a national network of dealers and distributors.